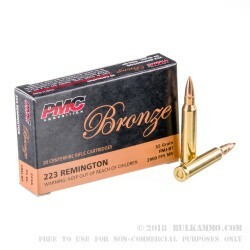 Pick up a case of PMC Bronze Ammo and you’re good to go for multiple range trips. Each case holds 1000 rounds of high quality .223 Remington ammo suitable for use in an AR-15 or any rifle chambered in .223 or 5.56 NATO. Each round uses reloadable Boxer-primed brass cases. 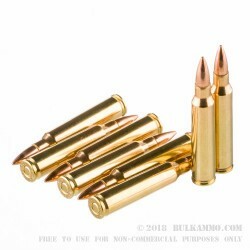 This ammo uses 55 grain full metal jacket bullets with a boat tail for maximum stability. Muzzle velocity is approximately 2,900 feet per second, delivering the flat trajectories and midrange accuracy AR shooters know and love. With a thousand rounds in this case, you could make one very ragged hole! Shooters frequently pick up PMC ammo in large cases such as this one because it offers an excellent combination of desirable characteristics: accuracy, consistency, affordability, and availability in quantity. These qualities are brought to you by the Poongsan Corporation, a South Korean munitions company that works hard to ensure that every batch of ammo meets rigorous quality standards. As a top supplier for the South Korean military, Poongsan has extensive infrastructure and expertise that enable it to produce vast quantities of FMJ ammo for serious shooters in the US. Nice ammo. I will buy again. dependable shells, never a problem firing, still have some 22-250 20 count boxes of PMC shells my dad reloaded back in the 70's. Just wish you could pick it up somewhere to save shipping. Great bargain - Great customer service! From order to delivery Bulkammo did EXACTLY what they said they would! Great quality, reasonable prices & fast delivery. This is the second time that I've ordered from here & no problems. PMC ammunition is, by far, a bargain! I have purchased 5000 of these. I've only used almost 1000. Shipped fast. Great price. Packing was secure. Great pricing, arrived quickly, very satisfied! Fantastic service and price from BulkAmmo! Great price, good product, very fast shipping. Great Deal on reliable ammo. Purchased for my DPMS Panther 223/5.56. Shoots great, good grouping. This ammo is used by "Front Sight" weapons defense training center. Very satisfied with the price of the ammo and surprised with the priority that the order was given. NO PROBLEMS.... JUST BUY IT!!!! Ammo arrived quickly and has been very reliable. I've gone through about 800 of the thousand that I bought a while back and have never had a single problem, and the ammo is relatively clean when using. Will definitely be buying more soon! 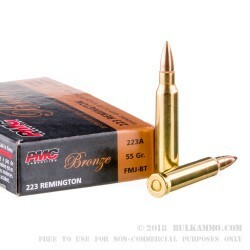 Myself and a buddy just bought some of this ammo and I have to say, BOTH the PMC and Bulk Ammo are Awesome AGAIN! This PMC ammo actually is the Best/Cleanest/Jewelry looking ammo I have ever seen! Not to mention, shoots Sweet out of my M4! Bulk Ammo had this to us on the 3rd day after ordering, Thanks Bulk Ammo! Prompt service good merchandise . First 40 rounds down range! would recommend this ammo !! good to go!! Ammo is known quantity. Good stuff. This review is for Bulkammo. Fair price, great service. You can't go wrong with Bulkammo. I've only sent a few hundred rounds down range so far, but it's been flawless. Great Ammo - Great Deal !!! I ordered 1000rds to split with family members. After shooting about 150rds myself and other family members also shooting it; we order another 1000rds. I am also planning a reorder of another 1000rds for my own use. Very happy with the purchase and prompt delivery. The 1000 count .223 cal ammunition I purchased about 3-4 weeks ago is absolutely worth the price I paid. I've only had 2 duds (which I buried primer up) out of around 500 so far (somewhat normal for me). This is the 3rd 1000 round box of this ammo I have bought. Have not had a problem yet. Ok, I had one round that was dented and did not feed. But one out of 3000 is pretty damn good. Wish I found this site sooner! 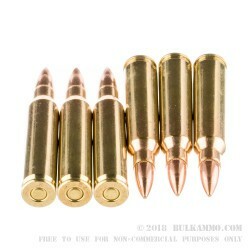 Great Ammo, clean firing. 280 rounds with no problems. good product, great company to deal with. A friend of mine just bought a Ruger 556 rifle, so we decided to split a case of ammo. Once it arrived, we headed to the range for some shooting. Solid pew pew, good price, not dirty at all.